Not only is it important for you to take a mom and dad break every once in a while, it is vitally important for your children as well. Why is this? There are a few answers. For starters, when you take a break from being super mom and super dad, you give yourself an opportunity to recharge your battery. Not only does this bring vibrancy back into your own life, it also brings freshness into your relationship with your children. You will find that when you take a break, you will have a renewed sense of patience as well as creativity. 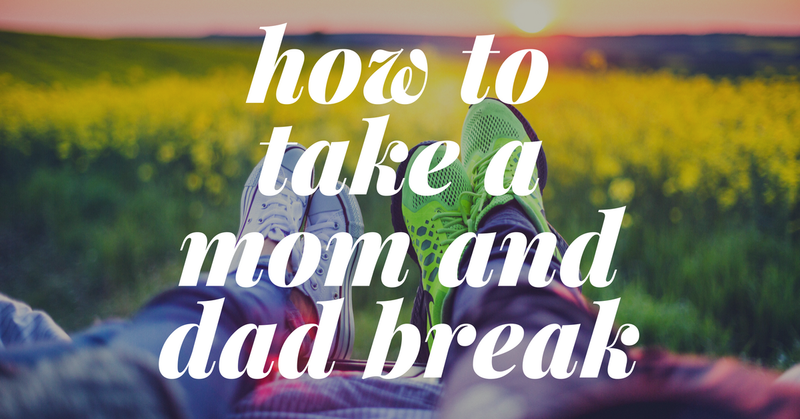 So, here’s how to take a mom and dad break for the good of the whole. As parents, we may tend to feel as though if we are not near or around our children at all times, something will happen and we will never forgive ourselves. However, if you look at this in a different light you will realize that you really don’t have control over everything. Letting go of control a little bit is healthy at times. Think about having a family member sit for you while you and your partner go for an overnighter. It is a great way to reconnect with one another and also stand strong as a couple in front of your children. Children learn sometimes which parent they can go to for which thing. Showing them that you are a united front is beneficial to their growth. Also, showing your children that you are a romantic couple making their relationship a priority is beneficial to how they view relationships when they grow older. Let go of the reins a little and take some much-needed and much-deserved time for mom and dad. No matter what happens, the kids will be just fine. It is important for you and your spouse to make regular time together, and be intentional about it as well. Showing your children that you are important as a couple and as individuals is important; however, so is showing that you keep your word. Children learn a lot about integrity by how it is shown to them. Be a role model for integrity and keep your word to yourself and to your spouse and go out every Saturday night or Tuesday evening or whatever works for you. Whatever you choose, make certain that you stick to it and are intentional about it. It’s okay for grown-ups to do things separately and individually as well. For example, one of you may have a hobby or sport that you love like fishing, boating, painting, yoga or bicycling, while the other is not really interested. It is perfectly okay to enjoy and even love these solitary things you do for yourself. As a matter of fact, it is healthy. You may wish to tag along once in a while for the sake of compromise, but never force the other to love what you love. Being a role model for your kids by showing them that being a couple means compromise as well as individuality, is the best way to teach them how healthy relationships show up. So enjoy that break, knowing it is good for you and your children.